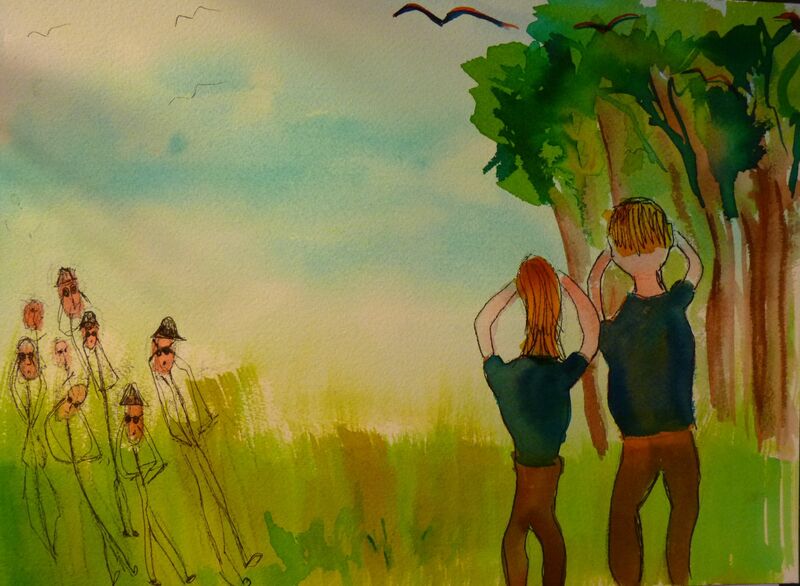 Birding Blind. Photo by Margo D. Beller. Despite the best effort of advertisers to make those of us of a certain age think we can stay young forever, there are times when you know you aren’t. Mine came after a Saturday eye exam. 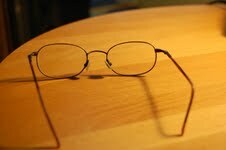 I was a near­sighted child who became far­sighted as an adult. Sometimes, I am a little too far­sighted – worrying about things to come that I can’t control. Like the other body parts, eyes age. The last time I saw the eye doctor, she decided to put drops in to dilate my pupils for a closer exam. My eyes turned out to be fine, but coming into the sunshine, I was literally struck blind. My husband had to run to the car for my sunglasses. It was after this that we went birdwatching, as usual, on a sunny Saturday. I can’t think of a more essential body part when birding than the eyes. I fear the day that I can’t see well when I want to do something I enjoy. I have met older birders who sit in one place and wait for the birds to come to them because they can’t walk very well. There may be blind or deaf birders out there, but I’ve never seen one. It is hard enough to find a small bird in a fully leafed­out tree with binoculars and two good eyes. It is a major challenge to find them when everything you see is surrounded by a corona of fuzziness. I’ve come to depend on my ears and knowledge of bird shape and habit more than my eyes, but on this day I discovered not being able to focus on details such as color and streaking put me at a severe disadvantage. At one point, MH and I were in a bird blind, a structure designed to allow you to look out without scaring anything. We were looking down from a small height to see if anything was skulking around in the brush. Bird blind, I thought. I’m a birder blind. Great. Going from sunny meadow (where I had to use my sunglasses) to shady woods, I could barely see at all. When something big flew from a tree at our approach, I had to depend on MH for a description. Based on that, and the vague shape I saw, I could only guess we had spooked a roosting owl – likely a barred owl. Barred owls can be active during the day. What I saw was too big to be a screech owl and not as white as a barn owl. It might also have been a great horned owl. I’ll never know. Meanwhile, MH had managed to turn his foot the wrong way and had to walk slowly. So he was limping. And I was nearly blind. Not exactly what the commercials portray of the golden years. The fuzziness is gone now, and I can identify the familiar birds in my backyard just fine. I am having a harder time ignoring my far­sightedness. I was driving to one of my favorite places to find birds in Morris County, New Jersey, near where I live, when I heard a strange noise and wondered what was happened to my engine. When I stopped at an intersection, I realized it was not my engine, but an invasion. You know the routine. It’s been the same since we were children. The middle of summer is defined by the whir of cicadas by day, and crickets by night. Both insects are doing the same thing – the males are calling out their availability to mate with females. This, however, is another type of cicada. This one has the science fiction name of Brood II. These cicadas will hang around for a few weeks calling, mating and creating new cicadas, then dying – their young not appearing for another 17 years as fully-formed teenagers itching to call and mate. So far, this plague has not made it to my backyard – yet. Plague isn’t too strong a word either. Cicada, according to the Random House Dictionary of the English Language, is a Latin word for locust. Unlike the locust, the cicada won’t ruin crops, and it won’t bite you. But it is an ugly insect, and it makes quite a din when you have a couple of thousand going once the soil gets warm enough, as it recently did. When I got to my birding location the cicadas were flying everywhere. The noise forced me to listen very hard to hear the catbirds, yellow warblers, house wrens and Baltimore orioles, among others. But with the exception of a few blue-gray gnatcatchers, none of the birds appeared to be going after the cicadas. Perhaps they had only just arrived this June day and the birds were too busy singing to protect their breeding territories. As I said, the usual New Jersey cicada feast starts in July when baby birds need to be fed. Or perhaps the birds were overwhelmed by the sheer number of them. I don’t know. But I do know I was more than a little annoyed at having to work harder than usual to hear anything over the din. I had been in the mountains of neighboring Sussex County the previous day, and had heard over 50 types of birds, and not one cicada, for which I was now grateful. Trying to identify 50 bird calls is hard enough when they’re all going at once. Trying to identify 50 bird calls with an extra layer of cicada whirring is torture. At some point I would hope the birds realize the early insect bonanza they have, and start eating. Birds aren’t stupid, or they wouldn’t have lasted so long. But for this birder, the end of Brood II can’t come soon enough. Many people keep a “bucket list” of things they want to do before they die. Birders have a life list. In the 1947 edition of his classic, “Field Guide to the Birds” of the Eastern U.S., Roger Tory Peterson included two pages with a list of birds covered in the volume. The idea was for a watcher to check off each bird when seen for the first time. He called it a “life list,” as in something seen for the first time in your life. Birders have been rushing around to see and record new birds ever since. My husband (MH) photocopied that list several times for me years ago, and I’ve used the copies to record birds from various places – my favorite birding spots in New Jersey and in New England, for instance – plus one to use as a master list. This list is so marked up it is hard to follow at times. I’ve had to add many birds as I traveled outside the East. Many birds Peterson considered accidentals, or rarities, in 1947, have become more common as their ranges expand, or as more birders go out in the field and find them. MH and I have, in our combined life list, seen 338 types of birds in the years we’ve been birders. This may seem like a lot to non-birders, but it is an almost pathetically small number compared with others who are out in the field nearly every day, or who travel the world, the United States, even their neighborhoods in search of new birds. Many have the time and money to do this, and I envy them. MH and I have to fit in our bird activities when we can. Still, we enjoy being together in our searching, sharing the successes and being wise enough to keep the failures in perspective. Some “life” birds have come easier than others. The prothonotary warbler that walked out of the bushes in Central Park. 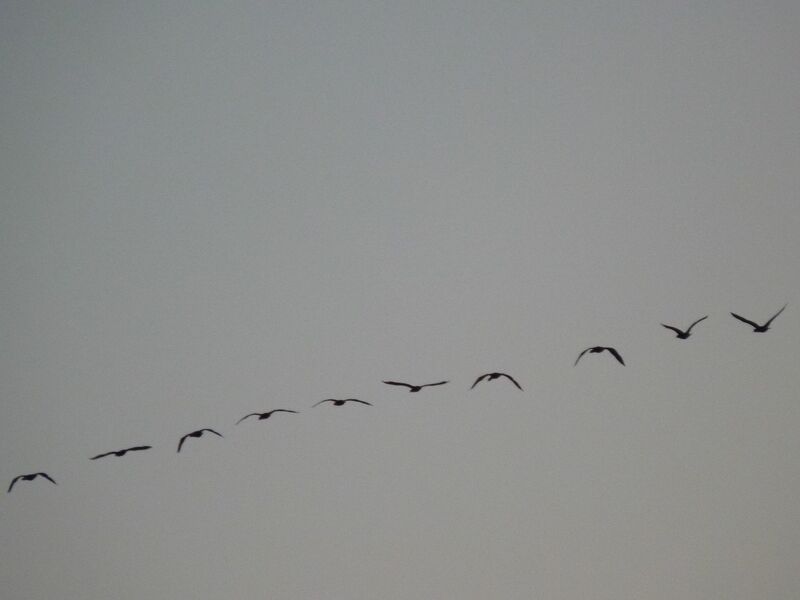 The sandhill cranes that soared over the Indiana toll road on our drive back from a midwest wedding. The anhinga, limpkin and kites we saw during a trip to the Florida panhandle. Our newest, the northern lapwing, came in March and we didn’t have to go too far. Three of these European visitors, with their distinctive crest and coloring, were found by others during the winter, hanging out in a cattle field on a farm in New Egypt, N.J. Like Alexis de Tocqueville, these old-world land plovers found favor with the new world, and were received enthusiastically. We came after the initial crowd frenzy ended, and were lucky to find another couple watching the birds with a scope, which they allowed us to use. We were also lucky the birds decided to fly around the field, making it fun to study them with binoculars. If travel broadens the mind, as the saying goes, we will have to do more traveling if we want to expand our life list, and our life. The birders and the boomers go birding. By Julie Seyler. I enjoy a good walk in the woods with my binoculars. If my husband comes along, even better. But I get really annoyed when we find ourselves in a crowd. We used to be considered unusual in our birding habit, but in recent years we’ve learned we are far from alone. My husband and I, both a few years past 50, have been known to be the youngest people in an area looking for a particular bird when we go on vacation. That is thanks to having no children and being able to travel when people with kids can’t. But that is very different on the weekends. We have found serious birders we can respect. More often we are forced to travel with flocks of families and less-respectful people around our age. I can’t speak for why the families are out there. They may be trying to teach the kids about “nature“ but too often the kids are running ahead and screaming while their parents are hanging back on their phones. As for the boomers, some, like me, may want to be challenged outdoors and look for something special that keeps them moving. But more often it seems to be all about the cameras. Either childless couples like us or whose children have left the nest – seem to have bought into the idea that we can use our money to do whatever we want now. Just as these “active adults” have bought into the idea of the large-screen TV and the computer-laden “crossover,” they want the smartphone and the point-and-shoot camera so they can travel the world capturing the birds, adding them to their life lists and displaying them on their Facebook or Flickr pages. These are the people the medical companies love, the ones urged to replace their aching hips and their balky knees and take this pill so they can keep doing everything they did when they were younger. These are the folks who will clamber over rocks and leave the trails to bushwack into tick-infested woods, eroding the eco-system. They can afford the expensive equipment, even if they don’t know how to use it. I know, not every boomer is like this. Many just like to go to natural places where they can walk completely oblivious to the birds that are scattering in front of them because their dogs are running off the leash. Then they wonder why people like me yell at them. It’s why my husband and I do our best to avoid them. Ever since my husband (MH), and I moved to our home and got a feeder for a housewarming present, I have been watching birds at my feeders and chasing them around fields, forests and seashores for over 10 years now. The number of feeders has only increased with my desire to see more birds, which in turn, has led me to try and see even more farther afield. There are many reasons I enjoy doing this. I like a challenge, particularly one that gets me out of the house and into the wood. I’m forced to sharpen my wits, use my eyes and remember many things, including field marks and songs. It gets me enjoyable exercise, walking long distances in new areas to at some very pretty (and sometimes not-so-pretty, birds), and it gets me away from the barking dogs and the noisy neighbors with their tech-savvy kids, who think I’m a strange old lady in this suburban neighborhood for going out in deep snow to shovel a path to the bird feeders. MH also enjoys watching the feeder birds and going out with me to see what he can see, although he isn’t as gung-ho about rising at early hours and driving long distances. Our different ways of looking at things shape how we go birding. I have a camera with a longish lens, and if we are in a place far from home that we don’t get to very often, I’ll take pictures to help me remember the scene. If there are birds I can photograph, so much the better. But generally, I rely on my binoculars for identification. Another difference: Say I’m out in the field and I hear something I’ve never heard before. I will stand and wait and wait until I see what called. I’ll note the size, the color, where I am (habitat, state), note any field marks, then come home to start digging through the many field guides I’ve bought to identify it. If that doesn’t work, I go through my CDs of bird calls. MH has a more scientific bent. He will look, too, and tell me what field marks he sees. He leaves the identifying to me, but once identified, he’ll go to a bookshelf and pull out a historical reference to learn when was the last time that bird was regularly seen in a particular area. Together we make a good team, and that has become one of the best things about our interest in birding, spending time together and adding memories. We may not have children together but we do have the birds.